Vitiligo is a loss of skin color in patches it occurs due to cells that produce melanin death or dysfunction. The causative factors for vitiligo are genetics, sunburn, stress, exposure to chemicals and virus. Its symptoms include the presence of pale patchy areas. 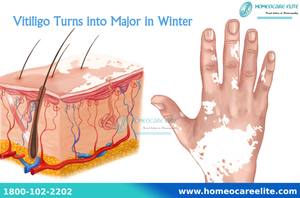 Homeopathic remedies successfully treat vitiligo with no issues of side effects the treatment duration depends on the severity of vitiligo.